For other uses, see Harlequin (disambiguation), Arlecchino (disambiguation), and Arlequin (disambiguation). Harlequin (/ˈhɑːrləkwɪn/; Italian: Arlecchino [arlekˈkiːno], French: Arlequin [aʁləkɛ̃]) is the best-known of the zanni or comic servant characters from the Italian Commedia dell'arte. The role is traditionally believed to have been introduced by Zan Ganassa in the late 16th century, was definitively popularized by the Italian actor Tristano Martinelli in Paris in 1584–1585, and became a stock character after Martinelli's death in 1630. The Harlequin is characterized by his chequered costume. His role is that of a light-hearted, nimble, and astute servant, often acting to thwart the plans of his master, and pursuing his own love interest, Columbina, with wit and resourcefulness, often competing with the sterner and melancholic Pierrot. He later develops into a prototype of the romantic hero. Harlequin inherits his physical agility and his trickster qualities, as well as his name, from a mischievous "devil" character in medieval passion plays. The Harlequin character first appeared in England early in the 17th century and took centre stage in the derived genre of the Harlequinade, developed in the early 18th century by John Rich. As the Harlequinade portion of English dramatic genre pantomime developed, Harlequin was routinely paired with the character Clown. As developed by Joseph Grimaldi around 1800, Clown became the mischievous and brutish foil for the more sophisticated Harlequin, who became more of a romantic character. The most influential such in Victorian England were William Payne and his sons the Payne Brothers, the latter active during the 1860s and 1870s. Although the origins of the Harlequin are obscure, there are several theories for how the character came to be. One theory posits that the name is derived from a bird with polychromatic feathers called a Harle Another theory suggest that the name Harlequin is taken from that of a mischievous "devil" or "demon" character in popular French passion plays. It originates with an Old French term herlequin, hellequin, first attested in the 11th century, by the chronicler Orderic Vitalis, who recounts a story of a monk who was pursued by a troop of demons when wandering on the coast of Normandy (France ) at night. These demons were led by a masked, club-wielding giant and they were known as familia herlequin (var. familia herlethingi). This medieval French version of the Germanic Wild Hunt, Mesnée d'Hellequin, has been connected to the English figure of Herla cyning ("host-king"; German Erlkönig). Hellequin was depicted as a black-faced emissary of the devil, roaming the countryside with a group of demons chasing the damned souls of evil people to Hell. The physical appearance of Hellequin offers an explanation for the traditional colours of Harlequin's red-and-black mask. The name's origin could also be traced to a knight from the 9th century, Hellequin of Boulogne, who died fighting the Normans and originated a legend of devils. Cantos XXI and XXII from Dante's Inferno there is a devil by the name of Alichino. The similarities between the devil in Dante's Inferno and the Arlecchino are more than cosmetic and that the prank like antics of the devils in the aforementioned antics reflect some carnivalesque aspects. The first known appearance on stage of Hellequin is dated to 1262, the character of a masked and hooded devil in Jeu da la Feuillière by Adam de la Halle, and it became a stock character in French passion plays. The re-interpretation of the "devil" stock character as a zanni character of the commedia dell'arte took place in the 16th century in France. Zan Ganassa, whose troupe is first mentioned in Mantua in the late 1560s, is one of the earliest known actors suggested to have performed the part, although there is "little hard evidence to support [it]." Ganassa performed in France in 1571, and if he did play the part there, he left the field open for another actor to take up the role, when he took his troupe to Spain permanently in 1574. Among the earliest depictions of the character are a Flemish painting (c. 1571-1572) in the Museum of Bayeux and several woodblock prints probably dating from the 1580s in the Fossard collection, discovered by Agne Beijer in the 1920s among uncatalogued items in the Nationalmuseum Stockholm. Tristano Martinelli is the first actor definitely known to have used the name 'Harlequin' (or 'Arlequin') for the secondo zanni role, and he probably first performed the part in France in (or just before) 1584 and only later brought the character to Italy, where he became known as Arlecchino. The motley costume is sometimes attributed to Martinelli, who wore a linen costume of colourful patches, and a hare-tail on his cap to indicate cowardice. Martinelli's Harlequin also had a black leather half-mask, a moustache and a pointed beard. He was very successful, even playing at court and becoming a favourite of Henry IV of France, to whom he addressed insolent monologues (Compositions de Rhetorique de Mr. Don Arlequin, 1601). Martinelli's great success contributed to the perpetuation of his interpretation of the zanni role, along with the name of his character, after his death in 1630, among others, by Nicolò Zecca, active c. 1630 in Bologna as well as Turin and Mantua. The character was also performed in Paris at the Comédie-Italienne in Italian by Giovan Battista Andreini and Angelo Costantini (c. 1654–1729) and in French as Arlequin in the 1660s by Dominique Biancolelli [it] (1636–1688), who combined the zanni types, "making his Arlecchino witty, neat, and fluent in a croaking voice, which became as traditional as the squawk of Punch." The Italians were expelled from France in 1697 for satirizing King Louis XIV's second wife, Madame de Maintenon, but returned in 1716 (after his death), when Tommaso Antonio Vicentini ("Thomassin", 1682–1739) became famous in the part. The rhombus shape of the patches arose by adaptation to the Paris fashion of the 17th century by Biancolelli. Trivelino or Trivelin. Name is said to mean "Tatterdemalion." 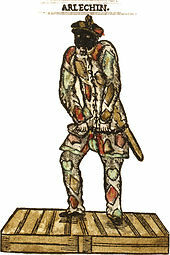 One of the oldest versions of Harlequin, dating to the 15th century. 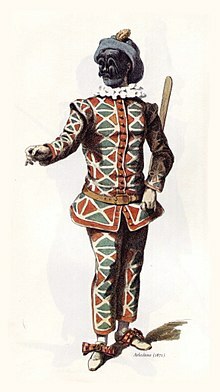 Costume almost identical to Harlequin's, but had a variation of the 17th century where the triangular patches were replaced with moons, stars, circles and triangles. In 18th century France, Trivelino was a distinct character from Harlequin. They appeared together in a number of comedies by Pierre de Marivaux including L'Île des esclaves. The Harlequin character came to England early in the 17th century and took center stage in the derived genre of the Harlequinade, developed in the early 18th century by the Lincoln's Fields Theatre's actor-manager John Rich, who played the role under the name of Lun. As the Harlequinade portion of English pantomime developed, Harlequin was routinely paired with the character Clown. Two developments in 1800, both involving Joseph Grimaldi, greatly changed the pantomime characters. Grimaldi starred as Clown in Charles Dibdin's 1800 pantomime, Peter Wilkins: or Harlequin in the Flying World at Sadler's Wells Theatre. For this elaborate production, Dibdin introduced new costume designs. Clown's costume was "garishly colourful ... patterned with large diamonds and circles, and fringed with tassels and ruffs," instead of the tatty servant's outfit that had been used for a century. The production was a hit, and the new costume design was copied by others in London. Later the same year, at the Theatre Royal, Drury Lane, in Harlequin Amulet; or, The Magick of Mona. Harlequin was modified to become "romantic and mercurial, instead of mischievous", leaving Grimaldi's mischievous and brutish Clown as the "undisputed agent" of chaos, and the foil for the more sophisticated Harlequin, who retained stylized dance poses. The most influential such pair in Victorian England were the Payne Brothers, active during the 1860s and 1870s, who contributed to 20th-century "slapstick" comedy. ^ Alexandre Manceau, engraver. Sand 1860, after p. 80. ^ Martin Rühlemann, Etymologie des wortes harlequin und verwandter wörter (1912). See also Normand R. Cartier, Le Bossu désenchanté: Étude sur le Jeu da la Feuillée, Librairie Droz, 1971, p. 132. ^ a b Katritzky 2006, pp. 140–143, confirms that the dating of the painting is generally accepted; p. 236: "...this figure is still widely accepted as a depiction of Harlequin or Zan Ganassa, although often with reservations." ^ Maurice Charney (ed. ), Comedy: A Geographic and Historical Guide, Greenwood Publishing Group, 2005, p. 239. ^ Boni, Filippo de' (1852). Biografia degli artisti ovvero dizionario della vita e delle opere dei pittori, degli scultori, degli intagliatori, dei tipografi e dei musici di ogni nazione che fiorirono da'tempi più remoti sino á nostri giorni. Seconda Edizione. Venice; Googlebooks: Presso Andrea Santini e Figlio. p. p. 1103. Sterling, Charles (1943). 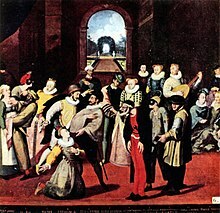 "Early Paintings of the Commedia dell'arte in France." Metropolitan Museum of Art Bulletin, New ser., v. 2, no. 1 (Summer, 1943). JSTOR 3257039. "Harlequin" . Encyclopædia Britannica (11th ed.). 1911. This page was last edited on 22 February 2019, at 06:24 (UTC).